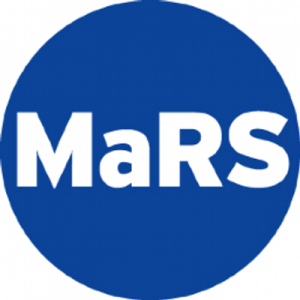 REFOCUS provides a roadmap for developing a transformation program that can actually establish sustainability as a key priority. 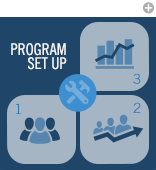 The REFOCUS Sustainability Program Model describes the anatomy of a transformational sustainability program. Below is a flower-like visual representation of the Sustainability Program Model in addition to a brief description of what each component covers. In this module participants are stepped through the process of building the capacities needed for a sustainability program to strengthen the bottom line. These capacities are like the roots of a flower. While they are not visible on the surface, they are crucial to the program’s success. Without well-established roots, a flower will lack nourishment and strength. 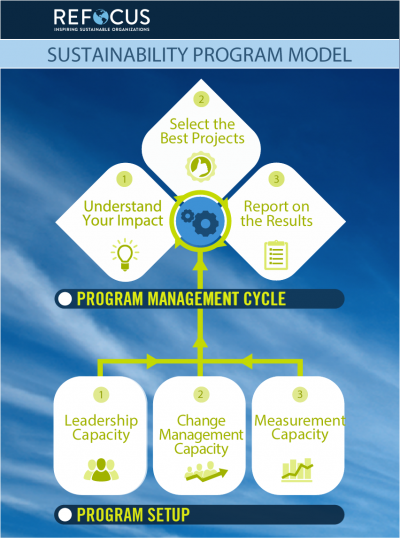 Without strong Leadership, Change Management, and Measurement Capacities, a sustainability program will generate limited benefit and remain weak or unstable. It is important to a solid foundation is established before taking action but naturally building capacities is an ongoing process that cannot be perfected right off the bat. We will look at how lacklustre leadership can hold a sustainability program back as well as the kinds of skills and abilities that effective sustainability leaders possess. 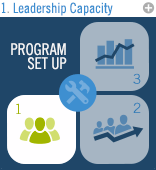 As part of building leadership capacity, we will examine what is involved in assembling a solid leadership team and developing a strong program vision. We will examine why implementing change is difficult. We will highlight what change management is all about and why it’s important to success. 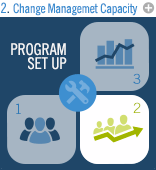 As part of developing change management capacity, we will look at what is involved in assembling a change management team as well as techniques for effectively engaging stakeholders and formalizing change. We will look at what you need to know about measuring economic, social and environmental sustainability. We’ll explore how to build the level of capacity a successful program needs, and how damaging it can be if we fail to build the capacity. 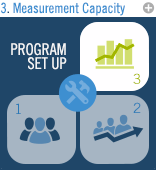 To employ the measurement capacity developed, we will lay out the steps involved in building a project assessment framework that can be used to assess the business case for sustainability projects. 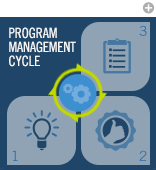 This module defines a repeated cycle of steps that participants execute as part of ensuring limited resources are invested into the projects that return the greatest benefit to the organization. Like a flower blooming each year, this is the actionable process repeated on an annual basis to generate results. 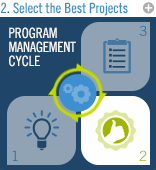 The steps include: Understand Your Impact, Select the Best Projects, and Report on the Results. 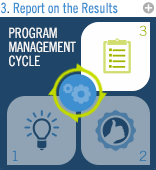 While this process is the most visible part of the program, the results generated are largely enabled or constrained by the how soundly the program has been set up. To be successful over the short and long term, it’s critical to balance building capacities with making progress and generating tangible benefits.